The Volunteers of America Bill Daniels Veteran Services Center, located in the hip, developing Santa Fe Art District, is not usually a quiet place. More than 13 independent veteran-serving organizations housed inside keeps the 25,000 sq. foot space busy with intake interviews, community events, and other veteran-focused projects. However, in a small office on the second floor, a dedicated tranquility can be found – in the home of a life-changing law clinic that has been operating through the University of Denver’s Sturm College of Law for the last three years. 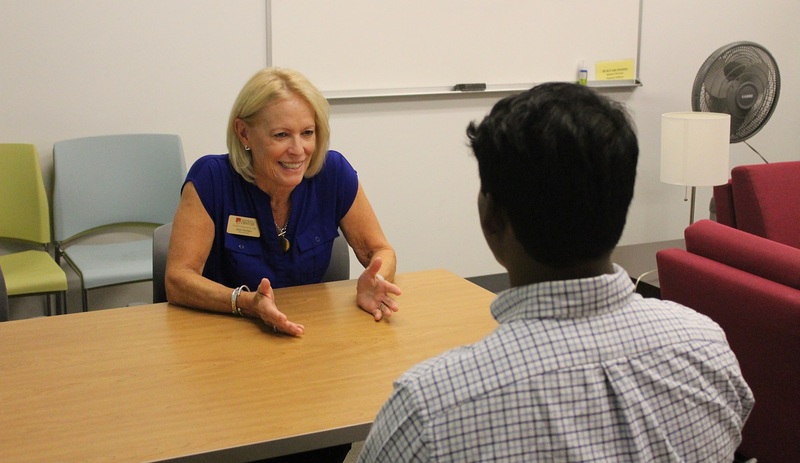 The pro-bono law clinic, appropriately titled the Veteran’s Advocacy Project (VAP), is headed by law professor and proud veteran mother, Ann Vessels. Vessels crafted the project, the only one of its kind in Colorado, while on sabbatical in the Fall of 2014. She was inspired by her son, Sean, a former Marine who faithfully served the country for eight years, including three tours in the Middle East. “Coming back from the Middle East, Sean had nothing. He had no money or home of his own, and he was going through a difficult time personally. He was hurting immensely,” says Vessels. The Veteran’s Advocacy Project works with Veterans to help them receive their VA disability benefits – benefits they earned while serving the country.The VAP focuses on VA disability benefit appeals. These complex appeals often take years, but the results can return stability and hope to the disabled veteran clients, many of whom are homeless and struggling in ways unimaginable. In addition to VA disability benefit appeals, the VAP works on Discharge Upgrade cases. Any veteran with a discharge that that does not qualify as “honorable,” can be denied benefits. Other types of discharges include “general” discharge and “other-than-honorable conditions” discharge. According to G.I. Jobs®, discharge titles can be affected by factors including “administrative reasons, security violations, use of violence, conviction by a civilian court with a sentence including prison time, or being found guilty of adultery in a divorce hearing.” Vessels and her team of volunteer pro-bono attorneys and law students work with these veterans to help them receive discharge upgrades and the accompanying benefits they’ve been denied. In just a few short years, the Veteran’s Advocacy Project has recovered more than $7.2 million for veterans through successful discharge upgrade applications and VA disability benefit cases. Vessels has witnessed veteran clients go from living on the streets to receiving upwards of $3,000 a month in VA benefits – a life-changing victory through the legal system and a testament to the importance of this project. The Veteran’s Advocacy Project has enabled many veterans to exit out of homelessness and return to a stable and overall much happier civilian existence. Vessels’ future goals include continuing to raise awareness and funding so that the Veteran’s Advocacy Project can spread from Denver to cities throughout the state and beyond, serving as many veterans as possible. Volunteers of America Colorado is proud to support Vessels and her team in this incredibly noble and worthy cause – helping serve those who provided and sacrificed so much to serve the country. To donate to Volunteers of America Colorado, visit www.voacolorado.org/give. To find out more about the Veteran’s Advocacy Project or donate, visit www.law.du.edu/veterans-advocacy-project.